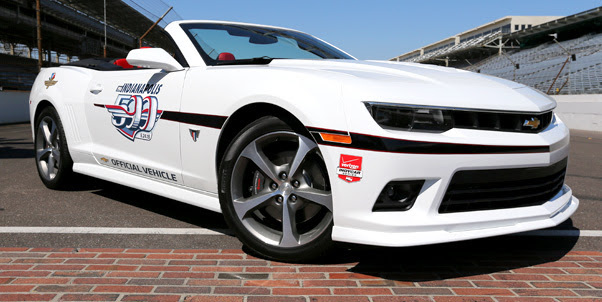 INDIANAPOLIS, Thursday, April 2, 2015 – The Indianapolis Motor Speedway and Chevrolet carried out a longtime tradition leading into the Month of May when the 33 directors of the 500 Festival received 2015 Chevrolet Camaro SS convertibles on the main straightaway of the Indianapolis Motor Speedway. The presentation was made as part of a 100 Camaro drive-away where the 500 Festival directors, officials from Indianapolis Motor Speedway and 50 Indiana Chevrolet dealer representatives took possession of the cars and experienced a lap on the famed oval. The “Festival cars” have reminded Indianapolis-area residents of the upcoming Indianapolis 500 since the 1960s, and this year’s fleet of unique Camaros will certainly turn heads as they are driven around Central Indiana. This year’s 500 Festival cars are based off the 2015 Camaro Commemorative Special Edition, which goes on sale this spring and is powered by a 400 hp 6.2L V-8 L99 engine with a 6-speed automatic transmission with tap shift. The exterior features of the Commemorative Edition include unique 20-inch wheels; exclusive stripe; body-color front splitter; ZL1 rear spoiler and Commemorative Edition fender emblems. The Festival cars feature a Summit White exterior with a black convertible top and adrenaline red and black leather interior. A black stripe with a red accent outline incorporates the 99th Running of the Indianapolis 500 graphic on the doors and includes the iconic IMS wing and wheel on the quarter panels. Additionally, the 500 Festival Camaros will receive a unique array of accessories including a full body-colored ground effects package, red engine cover, and special floor mats. For the first time ever, 50 additional special-edition Camaros have been provided to dealers across the state and are available for purchase. Several dealers within the networks of Central Indiana Chevrolet Dealers, Wabash Valley Chevy Dealers and Northern Indiana and Ohio Chevy dealers will be offering these distinctive vehicles in the metropolitan Indianapolis, Terre Haute and Fort Wayne areas respectively. The 99th Running of the Indianapolis 500 Mile Race will take place on Sunday, May 24.